It’s a story we see play out in Texas lawns every day: A homeowner wants a lush lawn, but also plants large shade trees to keep their home cool. Eventually, the shade trees get large enough to start doing their job. That’s when the lawn begins to suffer. Eventually, the tree always wins. Not only is shade a problem for lawns, but also the tree’s roots. Trees compete for much of the water and nutrients available underneath their canopy. Turfgrass is usually not up to the task. Turf grasses, such as St. Augustine, Bermuda and Zoysia are all sun plants. Ideally, they need a good six hours of direct sun a day to thrive. They’re not meant to be grown in shady conditions. “But St. Augustine is shade tolerant right? Shouldn’t it grow just fine under my oak tree?” Unfortunately, the actual shade tolerance of St. Augustine grass is widely mis-understood. Yes, it’s more shade tolerant than other turf grasses…but that doesn’ mean it grows well in the shade. 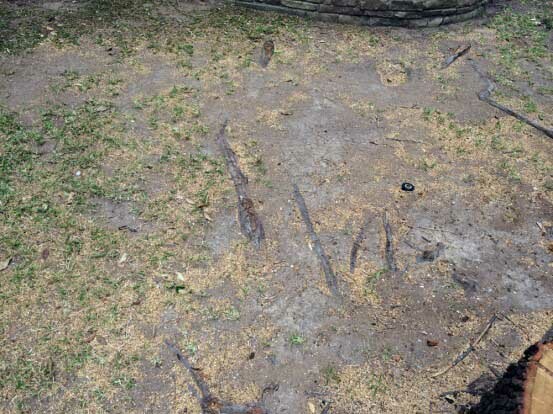 This is typical of how a St. Augustine lawn declines under shade trees. As you can see, the shadier it gets closer to the home, the more the grass has died out. “But my neighbor’s have shade and their grass looks fine!” We hear that statement a lot as well. Here’s the deal: Your shade may not be your neighbor’s shade. All “shade” is not equal. If their lawn is thick and healty, that means it’s probably getting at least 4-5 hours of direct sun each day. It may be spread out through the day, or it could be just in the morning or afternoon. Or their tree canopies are much higher than yours, meaning that more direct bright light is allowed into their landscape. It’s likely that you probably haven’t watched closely to see how much sun your neighbor may be receiving compared to you. In this photo, you can see that where the previous shade tree was growing on the right, the grass had weakened and thinnned out. The left side of the yard received more direct sun, thus a greener thicker lawn. “Is there something I can do? 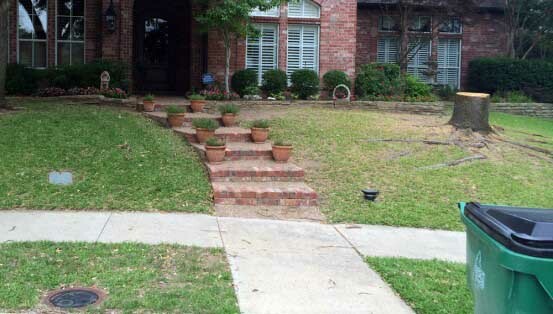 Can you fertilize the area so it will fill back in?” Unfortunately, water and fertilizer cannot replace sunlight. Light is needed by plants in varying amounts in order for them to properly generate enough energy for growth. Homeowners will often mistakenly water the area more often, thinking that will help. 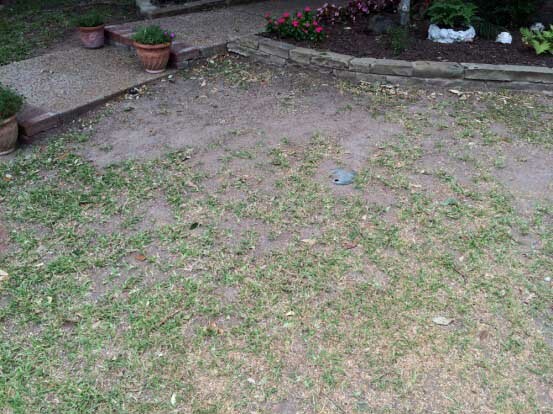 Overwatering, however, only causes more problems in St. Augustine lawns. Fungal diseases move in and roots are suffocated. The lawn will typically thin and die out even faster. “Ok, well, I’ll have my tree thinned out to let more light in for the grass!” This approach also has its failings and risks. Proper canopy pruning is a technical artform that should be performed with the supervision of an experienced certified arborist. Over-thinning is a very common problem in shade trees in the DFW area, which leads to big damage when a storm comes along. If you prune your tree too much, or in the wrong places, you could end up losing the tree altogether. So what’s the solution? If you have expanding shade trees, then you should consider transitioning the shadiest areas over to shade-tolerant groundcovers. Also, be sure not to over-water lawns that receive a bit more shade and be sure that you have your lawns aerated as part of your organic maintenance plan.